Here is an impressive release from Flying Leathernecks Decals. 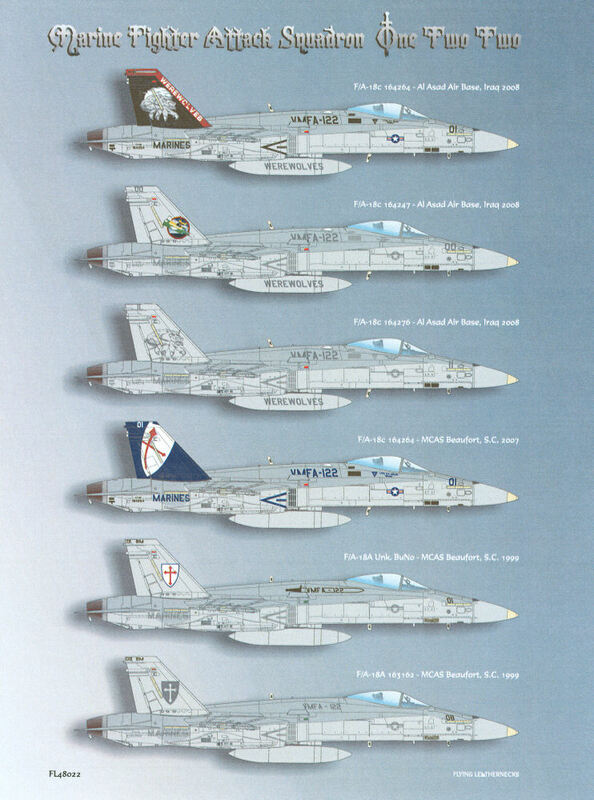 This is a huge sheet that covers virtually all of the F/A-18 Hornets of Marine Fighter Attack Squadron 122, the Werewolves. 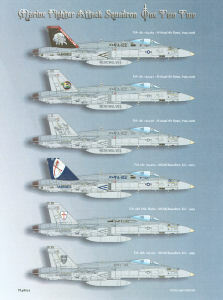 This set provides ALL of the markings you'll need on the airframe to replicate the VMFA-122 F/A-18C Hornets as they appeared on deployment to Iraq this year (including the MAG commander's aircraft, squadron commander's aircraft, XO's aircraft, and nine line aircraft), the squadron commander's aircraft as it appeared last year at home station, and two F/A-18As from 1999. 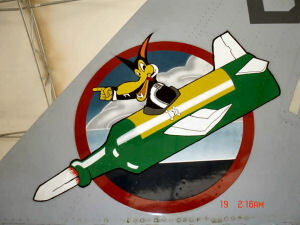 The sheet has all of the markings to replicate six aircraft from this one sheet with the exception of maintenance stencils - two complete sets of these are provided. The set even includes all of the pilot and plane captain names. The instructions and color profiles are provided, along with photographs of the aircraft in this set, all on a CD-ROM to make it easier to provide you with more data without the associated printing costs that would drive the price of this offering way up. You won't want to build a Marine Hornet without bombing it up appropriately. 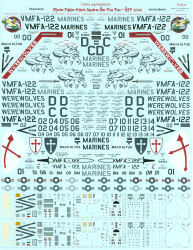 Flying Leathernecks previously released an extensive weapons stencils sheet here. 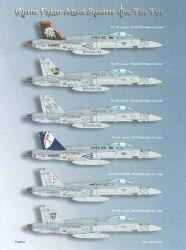 For more information about this set and the other releases from Flying Leathernecks Decals, visit their website at http://flyingleathernecksmodels.com. My sincere thanks to Flying Leathernecks Decals for this review sample!